Coconut is found all round the year and is no wonder this is called as the "kalpavruksh". It is quite widely used in the maharashtrian cuisine as well. 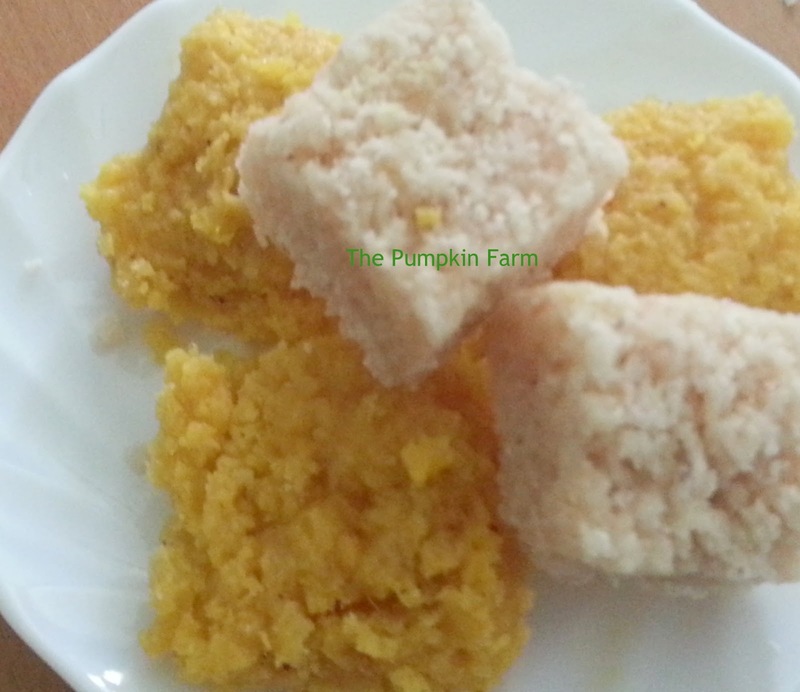 The one popular dish which I believe is made across religions in all coastal regions is the coconut fudge. I have heard about it as a dish for diwali, ganesh chaturthi, christmas or Id in the same jest. My mother made this on and off, as it is pretty laborious and with 3 kids to manage , it may not have been very tempting proposition. Likewise, I had stayed away from making it until the need arrived. Even in mumbai, we are blessed with umpteen trees in my our complex which yields us fruits in dozens. This month we got as many as 11 coconuts. Someone suggested making the fudge. 1) Pulse the coconut along with milk in a grinder to form a paste like consistency. Do not grind too much. 3)Now add the mango pulp and cardamom powder and cook for another 5-10 min. 5) Spread it with a spatula (coated with ghee) while it is still hot. 6) After 5-10 min, cut the cubes and let it settle for 12-15 hours or until it can be lifted. I love coconut burfis. Now i feel like making them & having. Makes me nostalgic, its always been my all time favourite, i dunno wat to chose,both barfis looks tremendous. I love coconut burfis, but the task of grating the coconuts stops me from trying :-). Lovely burfi and nice addition of mangoes. Pradnya..do I read Boiled Potato?..well are you sure/..its not mentioned in the recipe any where..either you have made a mistake..or may be my eyes need to be checked..wat ever the burfi sounds interesting! Never tried using mango sounds delicious. my all time fav sweet.happy to be your follower. my two favorite things in the world - mango and coconut - I would definitely love this one! Mango in coconut burfi sounds fabulous. Addition of potato sounds different and interesting. Wow never thought of adding mango to this..sounds and looks wonderful Pradnya..
it was very different than my usual way. love the addition of mango here. Potato - mango combo addition must take the humble coconut burfi to a new level.